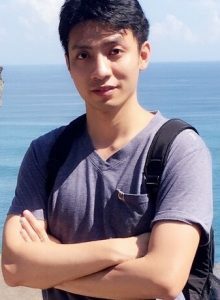 Pin Chieh Wu joined the Atwater group in June 2017 as a Postdoctoral Scholar. During his stay at Caltech, he was working on the active plasmonics and metasurfaces for the feasible application of light manipulation. He received his PhD in Applied Physics from National Taiwan University under the supervision of Prof. Din Ping Tsai. Prior to Caltech, he was a postdoctoral researcher at Nanyang Technological University (Singapore) and Academia Sinica (Taiwan) for two years. His research experience spans the strong field confinement for nanoplasmonic sensor, near-field interaction of metamaterials for the investigation of specific responses (such as Fano resonance and toroidal dipolar mode), integrated metasurface for versatile polarization generation and development of achromatic flat optical components with desired functionalities. He is now an Assistant Professor in the Department of Photonics at National Cheng Kung University in Taiwan.